In The Girl with the Dragon Tattoo, Daniel Craig plays journalist Mikael Blomkvist, a man who doesn’t quite have James Bond’s sharp sense of style. In the 2011 film, Blomkvist wears a black three-piece suit, with a modern cut. Though Bond rarely wears black suits, for a party in the evening it’s an appropriate choice. The button two jacket is trim-cut with straight shoulders, and Blomkvist wears it open for the brief time we see him in it. The waistcoat has five buttons, and they are placed low and close together. Craig leaves the bottom button open, and when he later takes off his suit jacket he unbuttons the top button as well. The flat front trousers have a plain hem. They are worn with a belt and have too short a rise to be worn with a waistcoat, thus some of the shirt peaks through. Though Bond never wears a mid grey shirt, it works very well with this suit. The darker shirt tones down the formality and severity of the black suit, but it’s not too dark either. The shirt has a spread collar and front placket. The placket is stitched a quarter-inch from the edge, whilst the collar is stitched an eighth-inch from the edge. The narrow black tie is woven in a ribbed ottoman weave. Blomkvist wears the shirt collar unbuttoned and his tie loosened, a sloppy look that would be out of character for Bond. But it’s in character for Blomkvist, as it has been a fashionable look as of late for younger people. 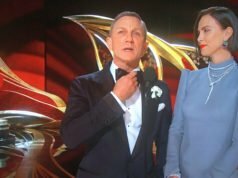 Daniel Craig is too old to look fashionable with a loosened tie, if anyone can indeed look fashionable with a loosened tie. Naturally, he wears black shoes with the black suit. Thanks for the write up. I like the low cut, five button waistcoat plus the straight shoulders that have been fashionable for a while now. Indeed, it would look better if he had higher rise trousers, but this portrayal of Blomkvist isn’t as frumpy as the novel and Swedish films. I give credit to Daniel Craig for taking a role where he’s not an action hero, though. He stopped working out and ate whatever he wanted for a while in preparation. Though modern fit suits may not be to everyone’s taste, he’s still better dressed (more appropriately for a trial in particular) than Michael Nyqvist was in the Swedish film. Haven’t seen the film but on the photos, sorry, don’t see it, dull, unattractive, like a bank clerk from the 70’s. I much preferred the casual clothing in this film. I thought they really nailed it with the chunky sweaters and so forth. 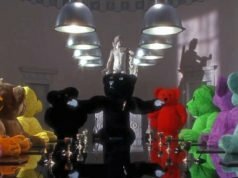 Definitely fits the character (very good movie too, both versions) and a good reminder that every suit on this blog is a costume, meant to convey information about a character. This outfit made absolutely no impression on me. It just looks dark, sad and sinister to me. Perhaps plain black suits can look good worn at evening parties, I don’t know, but at least one should mix an interesting-and colored- tie with it. 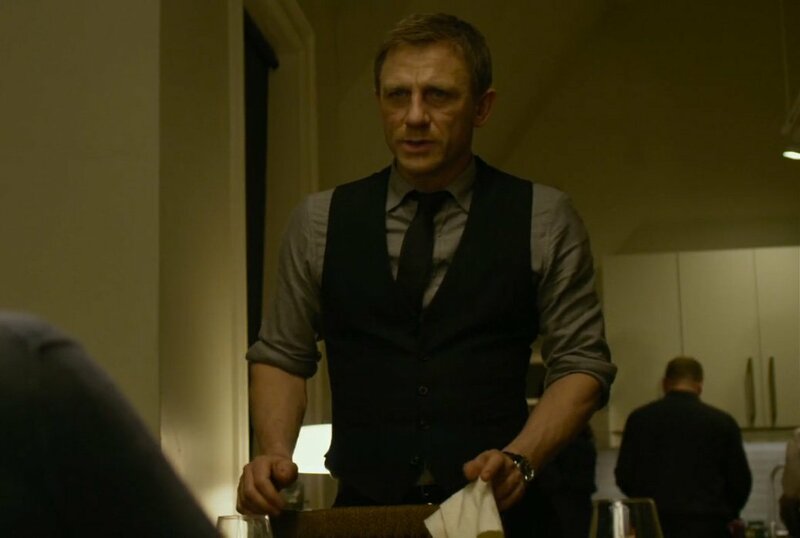 I am not mad of grey shirts worn with a suit and tie, but I think that in Layer Cake Craig wore a similar combination that looked much better. Most costume designers strive to show something about the character and their mood through clothing. At this point in the movie, Blomkvist just got slammed in court for libel and is just barely smiling through the Christmas party with his family and friends — everyone knows he’s upset of course. Unlike the Swedish film and book, he doesn’t serve three months’ prison time, but is still required to pay millions in “damages” to the CEO he tried to indict. So, dark, sad, and sinister? Precisely. He’s pretty closed off to the world here. Great movie, thanks for reviewing this suit.